A Group of Woodcocks (aka Timberdoodle) is called a Fall. New York City just experienced a massive fallout of a huge Fall of Woodcocks after the snow storm. The last couple of days were great days for birders. I saw more Woodcock yesterday in Central Park than I have ever seen in my entire life, 11 of perhaps hundreds. 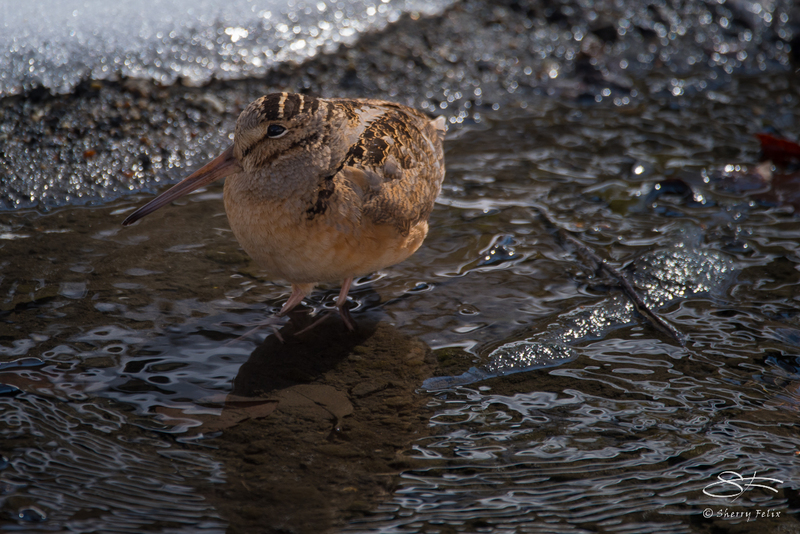 I also saw a Wilson’s Snipe. It isn’t so good for the Woodcocks. The poor Woodcocks were not expecting a snow storm to get in the way of their migration: Many have died hitting buildings; hawks and falcons are dining on them; and cold is also a problem. They have been seen huddled together, probably to stay warm. Normally I rarely see any because they are so well camouflaged. They sure stand out against the snow. In Central Park they are hanging out by streams looking for food. I hope they survive and continue north to breed soon. If you find an injured Woodcock put it in a paper bag and get it to a bird rehabilitator, like the Wild Bird Fund in NYC. See what to do with an injured bird. Their beaks are delicate and they need to be in something soft like a bag. More about Woodcocks at Cornell. Also see American Woodcock Event in Central Park March 15 – 17, 2017 by Anders Peltomaa. I created and maintain the Linnaean Society of NY’s website. What lovely little birds! Thank you for being their advocate! Hope the ones that made it have lots of babies. Thanks. I have seen better ones taken that day. oh wow what stunning pictures but so sad to hear about the impact of the snowstorm on them. Hope those that survived are doing ok now. Thank yoi. I hope they are OK too. These poor things. I do worry for them. And more cold on the way. (Sigh) winter seems to just hang on this year. Let’s hope they find some melted spots along their way north. I had never heard of the woodcock until the local conservation society organized a field trip. The field trip was cancelled due to winter storm Stella but I had fun researching this odd looking bird. Glad you like it. My husband, Marc, loves Woodcocks. One of the sounds they make is called a peent. Quite welcome. Groups of birds have lots of unusual collective nouns. Here’s some more: http://www.palomaraudubon.org/collective.html Some you know already. Thank you. Spring is comming soon. Super cute species! I hope things get better for them! I do too. My husband and I love them. They have a tough time getting through Manhatten. They fly low. The snow needs to melt do they don’t starve. I’ve been wondering how you were doing with the snow storm this week, Sherry. I see you’ve done fine, but I’m sorry to hear about the woodcock fallout. But what an amazing thing to see so many woodcocks all at once. Ordinarily I see one every few years. I’m sure it created quite a birder stir…but I know we all hope they are on their natural way soon. Thanks for sharing this unusual activity. There are lots of posts on social media about the woodcocks. Beautiful photos :-). The woodcock looks quite fluffed up against the cold with its gorgeous feathers. Sad that they are having a tough spring this year. Hopefully the coming months will be gentler. Thanks. There are lots out ther better than mine of these birds. Let’s hope some live to have babies. Wonderful photos. Particularly tough time for the birds in winter. Yes, it is bitter sweet.